Those of us whose sympathies are inclined to the Stuart cause must forever be drawn to Frascati. For it was in this modest town, close to Rome, that the last direct Stuart heir to the Throne of England died in 1807. Henry enjoyed the title of Cardinal Archbishop of York, conferred upon him by the Pope. Whether Henry enjoyed Frascati, I do not know. He should have done, because this hilly area was much favoured by the wealthiest Romans. Here they built villas of remarkable magnificence and beauty, to which they could repair when the bustling streets of Rome became too hot or too noisy. On the road between Frascati and Grottaferrata is one of them. 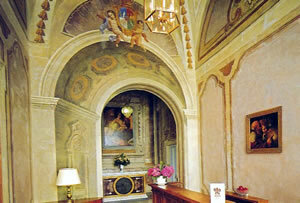 It has been restored and is now a fine hostelry: the Park Hotel Villa Grazioli. 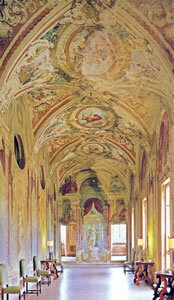 It was another cardinal of the Holy Roman Church who built this grand retreat on the Tusculum Hill, 14 miles from Rome. His name was Carafa, and he was clearly a man of consequence in 1580. As I passed through the gates in the hire car – collected at Rome Ciampino airport, which is nearby – and trundled along the very long drive, I needed no persuading of the power and wealth of the Church in 16th century Italy. I arrived before the Villa and all was peace and quiet. The extensive grounds ensured a sense of separateness from all around. The building, standing proud against the bright blue sky, suggested something beyond – and, once I had walked right up to the side wall, there it was: down below a broad valley and, sitting on the far side, in the hazy distance, the clustered domes and roofs of the Eternal City. Remarkably, the public rooms of the Villa are even more impressive than this panorama. As soon as I arrived, I began to wander through them, wide-eyed. 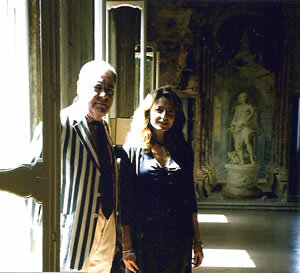 Later I was given a proper tour by the dashing Chantal Mastrogiacomo, the Marketing and Sales Manager. She and I were caught by the camera, and I reproduce for you the resulting artistic photograph. These extensive frescoed halls, with their chandeliers of Murano crystal and working fireplaces, are truly delightful spaces and are much in demand for the weddings and receptions of persons of taste and means. The best of them is the galleried hall (pictured), painted by Pannini in 1736, which is an acknowledged masterpiece of its period. Guest bedrooms are located in the main building – on the second floor (there is a lift), the first floor being devoted to public rooms – in the lodge and in the old coach house. In contrast to the sumptuous elaboration of the public areas, the bedrooms are plain and uncluttered. Number 222, in the main house, was classified as a Double Deluxe and was therefore 275-320 euros a night, bed and breakfast for two, according to season – which I judged good value. Its small hallway had fitted wardrobes and led into the high, white bedroom. Here there were two armchairs, a compact writing table and a Persian rug on the tiled floor. From the window I could see the side of the Villa Aldobrandini in Frascati. In the tiled bathroom there was room for a bidet, as well as the tub and one wash basin. This was a decent billet, made a little special when I opened the window on my first morning and heard the wonderful birdsong from outside. Apart from the attractions of Rome itself (enough, surely for a hundred lifetimes), there is much to see and experience in the towns and villages of the immediate area. Since I have a taste for the liturgically exotic, I made the five minute drive to the Uniate Greek Orthodox monastery of St Niro for Sunday Mass. (The Uniates are in communion with Rome.) It was, as I expected, a rich and complicated service. It was also very long. After two and a quarter hours, and with no discernible progress having been made (to my untutored eye), I slipped away and drove on to Castelgandolfo – site of the Pope’s summer residence – for lunch. With such pleasantries were my days filled. My evenings were devoted, as usual, to that loveliest of secular rituals – dinner. 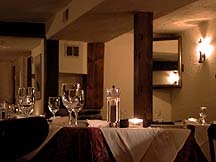 The hotel’s Aquaviva Restaurant is another grand space – although there are no frescoes – with extravagant gilt wall lights, large, well-spaced tables and canned Beethoven. I am not, as regular readers will know, a fan of canned music. But, if there has to be canned music, let it be Beethoven. I liked the touch of grandeur here: silver domes were lifted by the waitresses in their burgundy waistcoats and the assistant maitre d’, Roberto Pecorari, was smart in his black tie. 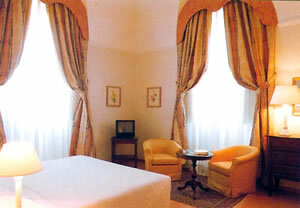 Signor Pecorari looked after me with considerable diligence throughout my stay. Drinking here can be very modestly priced indeed. Even the super Tuscan, Tignanello, is only 90 euros a bottle, and I can recommend the cheapest white wine – a local Frascati Superiore for 12 euros, which I found clean and crisp, with a hint of melon (Poggio le Volpi, 2007). 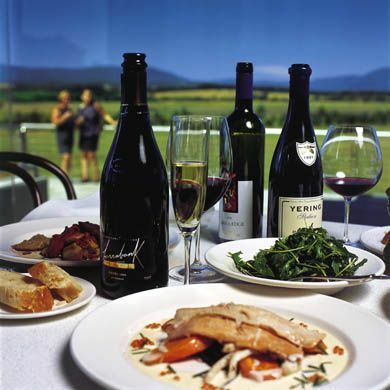 The list, with about 100 offerings, does not give vintages, but it does give the grape varieties used to make each wine and the alcohol level of each wine. Of the rest of my drinking, by far the most interesting was another local bottle, this time of red. The Casale Marchese 2003 was boldly structured, with lots of ripe black fruit, a rich and lovely bottle for just 22 euros. 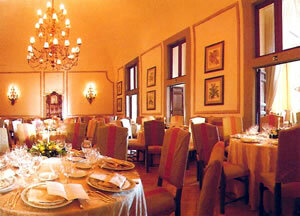 For breakfast, a buffet table was set out in the high, vaulted cellars. While the friendly waitresses set pots of hot coffee on the yellow cloth of my table, I secured bowls of Rice Crispies, of poached pears and of fruit salad, together with slices of lemon cake, plates of bacon and glasses of fresh orange juice. My days thus began in a leisurely and civilized manner. 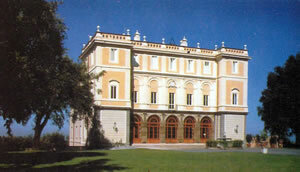 Indeed, leisure and civilization coincide happily at the Villa Grazioli. I wonder if Henry, Cardinal Archbishop of York, ever came to call? Via Umberto Pavoni 19, Grottaferrata 00046, Italy.